A Reference site of images, articles, artifacts of the Second Massachusetts Cavalry including the Cal 100 and the Cal Battalion. "…all of a sudden it became a hand-to-hand affair. It was soon evident to Reed that he was in for a whipping, and his men began breaking through the fences and into the field, but fighting all the while. His Californians, especially notoriously good fighters, were standing up to the rack like men, dealing out to us the best they had. They rallied at every call on them and went down with banners flying." ---John W. Munson, from Reminiscences of a Mosby Guerilla. "Captain Reed, whom he passed in his rapid career, by a shot from his revolver inflicted upon him a dangerous wound, which brought him to the ground. Chapman, seeing his friend fall from his horse, spurred forward to engage the man by whom he had been shot, and, when within three feet of Reed, fired, killing him instantly." ---Major John Scott, Mosby's Rangers describing the death of J. Sewell Reed. From Partisan Life with Mosby, 1867. James Sewall Reed was born April 3, 1832 at Milton, Massachusetts. He was the first of three sons born to John Reed and Miranda Barker. He had two younger brothers, George and Edwin. During his late teenage years, James' adventurous disposition began to manifest itself and at the age of seventeen, he took his younger brother George, left his family and Boston and headed west, likely having been caught up in the gold fever of 1849. The two young brothers arrived at San Francisco in March of 1850 and then relocated to Nevada City where they tried to make their way mining gold from 1850 to 1852. They eventually returned to San Francisco where at the age of 23, James became a member of the Vigilance Committee. Here he stayed until 1856 when gold fever again struck and in 1857 James again left San Francisco, this time headed for Central and South America to try his fortune. Apparently his efforts met immediate default as he returned to San Francisco in 1858, only to leave again, this time heading north into Victoria, British Columbia and the back country of the Canadian northwest. Again, his search for gold proved futile and he was soon back in San Francisco. In the spring of 1859 Reed returned to Boston. Here, he met and married Hattie L. Wales in Dorchester, Massachusetts and both returned to San Francisco in September. Married life seemed to bring some stability to Reed's endeavors, as his travels in search of gold were at an end. The year 1861 brought great evolution to the life of J. Sewall Reed. The winds of war began to blow in the east as the strife between North and South became more heated. On January 25, Hattie gave birth to a son, Walter Sewall Reed. (Walter would die of Nephritis at the age of 25 in 1886.) The momentum of war increased and many regular U.S. Army officers in the bay area resigned their commissions, returning to the east to fight for the side they favored. Doubtless caught up by this martial spirit, J. Sewall Reed rejoined the First Light Dragoons in November, 1861 and rose to the rank of Captain at the age of 31. However, any thoughts of fighting against the secessionists came to naught, as the 1st Dragoons found themselves patrolling the overland mail routes doing guard duty around the western posts and occasionally fighting Indian parties. The California newspapers were soon filled with details of severe fighting between the North and South. Unknown places such as Manassas and Shiloh Church suddenly became household words, as accounts of heroic charges spread through the newspapers. By late 1862, any thoughts that the war would end quickly had dissolved and a long and bloody struggle loomed ahead. Captain Reed appears to have been motivated to participate in the conflict as he began to explore what means might be available for his return to the East. Other transplanted Easterners in the Bay area were eager to return, driven by patriotic fervor or simply a desire to get into the fight before it was over. In the Fall of 1862 a group of these Easterners approached Govern or John Andrew of Massachusetts proposing to supply a company of 100 Cavalry volunteers. The Governor readily agreed, allowing the state's enlistment bounties to pay the men's steamship passage East. The volunteers would be required to supply their own uniforms and equipment with the help of local contributions. Captain Reed's role in these negotiations is not known. Recruiting for the "California Hundred" began immediately. Advertisements were run in California Newspapers, beginning with the Alta California on October 28, 1862. The response was overwhelming and many applicants had to be turned away. The hundred successful volunteers were likely chosen from among the more rural horsemen. Captain Reed must have played a key role in the recruitment, as he resigned his commission in the Light Dragoons and assumed the Captaincy of the newly formed California Hundred. Prior to his departure, Captain Reed was presented with twin revolvers and a complete set of saddlery which had been made by Main & Winchester, a major leather goods supplier in San Francisco. 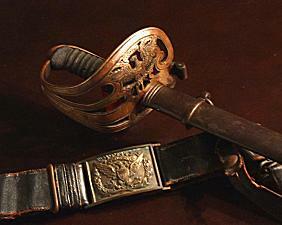 It is possible that he purchased his sword from a local militaria outfitter while in the service of the Light Dragoons, or at his enlistment into the Cal Hundred. More likely, it was obtained upon his arrival in the East. He also made a last stop at the studio of William Shew, a San Francisco photographer who made several photographs during his visit. The images from this sitting provide most of the photographic history available for Captain Reed. Unfortunately, the sword worn by Captain Reed in these photographs is not the same sword identified to him and purchased from his family. Around this time a local masonic regalia supplier named Daniel Norcross presented the Cal Hundred with their guidon, a red and white banner which bore the image of the California Bear. The Hundred were also loaned the use of 50 swords from the Light Dragoons for use in drills while aboard ship. The swords were to be returned when the troopers were issued proper sabers in the East. On December 10, 1862 Captain Reed and the Cal Hundred set sail on board the steamship Golden Age, bound for Boston via Panama. On their arrival in Massachusetts, they became Company A of the 2nd Mass Cavalry under the command of young Charles R. Lowell Jr. of genteel birth in Boston. (Of the Lowells and their high-born neighbors, the Cabots, it was said in Boston, "The Cabots speak only to the Lowells and the Lowells speak only to God.") Despite his blueblood upbringing Colonel Lowell proved himself to be an exceptional tactician with remarkable coolness under fire. Captain Reed and he doubtless enjoyed a close association. The Cal Hundred would later be joined by four additional companies from California comprising Companies E, F, L and M of the 2nd Mass. The seven remaining companies were composed of Massachusetts men. For a short time, the rough and ready Californians enjoyed a strained honeymoon with their citified Massachusetts counterparts. The regional differences led to inevitable rivalries among the men, and black eyes and bruises were not uncommon. But combat would soon join the men in a much tighter bond. After only a few weeks of preparation, Captain Reed and the Cal Hundred went south to Virginia where from April through July of 1863 they scouted out of Gloucester Point and skirmished with Confederate Cavalry on a number of occasions. During the next six months, Captain Reed and the Cal Hundred were outfitted with sabers, sidearms, and a mix of Burnside and Sharps carbines. While in the Shenandoah Valley they were constantly engaged with Confederate Major John Mosby's Partisan Rangers. As a Cavalry Captain Reed was involved in numerous scouts, expeditions, and skirmishes which included South Ana Bridge, Hanover Court House, Ashby's Gap, Fairfax Court House, and Leesburg, Virginia. "I have not seen the letters in the California papers and do not think I care to. (Capt.) Reed is a very good officer, takes the greatest pride in his company, and since that trouble, has done well by them." Early on the morning of February 22, 1864 Reed arose and departed camp at Hunter's Mill Post with three companies, B, E and M, to scout the countryside near Dranesville, Virginia. Lying in wait, Major Mosby used a well planned ambush to surprise the Union troopers and a brief but intense engagement erupted. When the smoke cleared and the commotion ended, five Californians were killed, three wounded and twenty-seven taken prisoner. Among the dead was Captain J. Sewall Reed. The remaining Union Cavalry companies were scattered across the countryside. When word reached camp that a fight had occurred Company A quickly mounted up and rode to the scene of the bloodshed. Here they found their comrades lying where they had fallen several hours earlier. Captain Reed had been stripped of everything but his underclothes. "Last evening, as the slant rays of the declining sun threw their sheen over the Hudson and up the bluff by the Riverside, a soldier's bugle sounded over the great Captain's grave the call to sleep. Today, in the proud hearts of a nation saved, he rises to live again and forever.